Global Health Corps provides a yearlong paid fellowship for young professionals from diverse backgrounds to work on the frontlines of the fight for global health equity at existing health organizations and government agencies. Fellows are currently working in Rwanda, Burundi, Uganda, Malawi, Zambia and the United States. GHC recruits placement organizations that are doing excellent work in improving healthcare access and health outcomes in impoverished communities. Placement organizations range from small grassroots organizations to large global institutions. Global Health Corps recruits and selects highly qualified applicants with diverse skill sets for specific fellowship positions at these organizations. Fellows have built financial management systems for grassroots HIV organizations in Uganda, counseled homeless teenagers in New Jersey, supported district pharmacies in Rwanda in rolling our new supply chain management tools and conducted policy research in Washington DC. Fellows come from a wide range of educational and professional backgrounds, as each individual fellowship position requires different specific skills. Posted on November 6, 2014, in Africa, Career, Fellowship, Global, Opportunities, Social Entrepreneurship and tagged Apply! 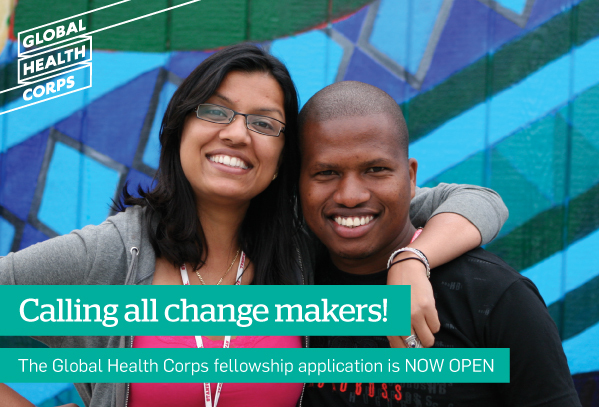 Global Health Corps Fellowship 2015-2016, Fellowship, fellowship position, fellowship positions, GHC Fellowship, Global Health Corps, global health equity, grassroots organizations, Health Corps, health organizations. Bookmark the permalink. Leave a comment.